Intelliscreen is now available for firmware 2.0 via Cydia. You need to add the Intelliborn source for Cydia which is intelliborn.com/cydia. I don’t notice any new features. Note that after installing you need to turn your iPhone off and back on to complete the install. At first I though I got the SWOD (spinning wheel of death) but after about 30 seconds the springboard re-sprang and everything was fine. Installation an re-retrieval of lizense worked great. Intelliscreen was not free, right? Is it really free now? hmm i had this on 1.1.4 and it rocked….i put it on my now 2.0 and restarted but it wont show…??? Horaay! Now all I need is MCleaner…then can sell my 1st generation iphone..
Works like a charm! 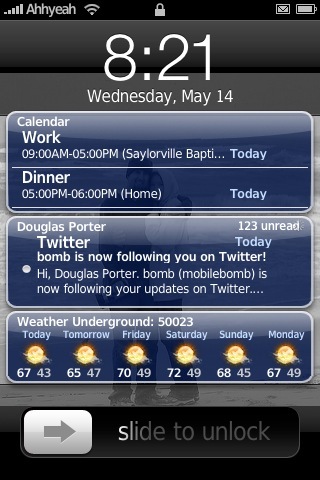 Now the iPhone feels more like a smart phone! Thanks for the news! It runied my perfectly configured 2.0 phone. I was a happy user with my 1.1.4 phone but I cannot recommend this right now … :( …hate that 3 hours restore now .. This App ruined 4 times my iphone completly, “spinning wheel of death”, it conflicts with some apps, i´ll never use it, sure i liked it very much but thoses messed iphones, never again. Sorry, no, that was a typo, fixed now. Its a shame its not free, i mean we install 3rd party apps for a reason, because we can’t get them through apple, so why someone feels they can charge what i see as a ridiculous amount of money as alot of apps in the app store cost less than 4.99 and are of more use. anyone else got the “bad URL” after trying to add source in cydia? OUTSTANDING!!! Currently using my iPhone 1st Gen to test new Cydia apps as it’s jailbroken and my 3G is not. Works just as it did before on 1.1.x. This is the KILLER iPhone app. I missed it so much on my 3G. So after more testing…dare I Jailbreak my precious new iPhone?!?! Question for intelliscreen users. Can I view password protected RSS feeds with this? I’d love to see my company’s project management feed right on my “slide” screen, but it’s a password protected feed. So far, none of the free readers I’ve seen support feeds with password protection. Nope. No secure RSS. 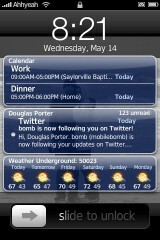 Does anybody know if any RSS reader on the iphone will do this? Did anyone else notice if this changed the font of the labels under their icons. I installed this and Installer at the same time, so I am pretty sure one of those two did something. After installing those, the labels under my icons changed, and the font of the time in the status bar changed. Not a big problem, just now some of my icon labels run into eachother. Hopefully I won’t have to wait for FontSwap to be ported, for me to fix it.